Sabina Police Chief Keynon Young with Connie Adams of Modern Woodmen. Local departments were recently recognized for countless hours of service to their community during a Modern Woodmen event. The Sabina Police Department and the Wilmington Fire Department were honored through Modern Woodmen’s Hometown Hero Program. They were recently recognized for the countless hours of service to their respective communities. Members of the Sabina Chapter 5994 presented the Sabina Police Department with a certificate and a $100 award grant to be donated to the charitable organization of their choice. 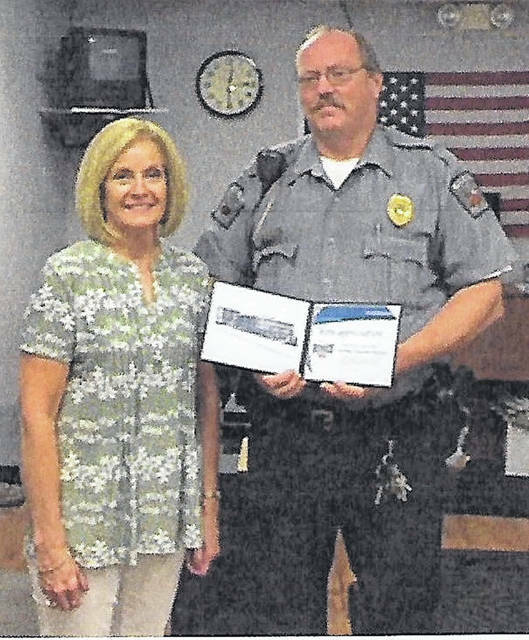 The Sabina Police Department selected the Clinton County Foundation for SABA. Members of the Wilmington Chapter 17199 presented the Wilmington Fire Department a certificate and a $100 award grant. Their charitable organization recipient was the Wounded Warrior Program. Connie Adams, local Modern Woodmen Activities Coordinator, states that Modern Woodmen’s Hometown Program gives them the opportunity to say thank you to both of these departments who selflessly give “above and beyond” in serving their respective communities. Coordinated by local Modern Woodmen members, the Fraternal Financial Services organization’s Summit Chapters, Chapters and Youth Service Clubs provide opportunities for members to take part in social and educational activities and volunteer projects to meet local needs. For more information or to get involved, contact Adams at 937-383-3400, at the local Modern Woodmen office.